Last edited by melitikus on Tue Dec 02, 2014 7:43 pm, edited 1 time in total. So, let's start! Which ebt member is the first who will find Lithuanian coins outside Lithuania? 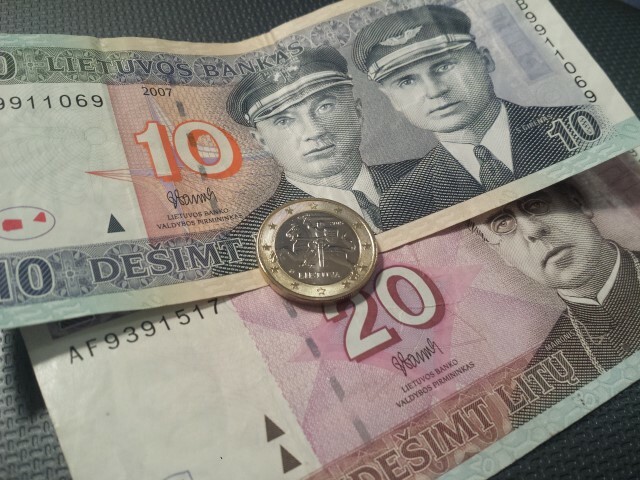 Journalist from 'Verslo žinios' in the first half of December used Lithuanian euro coins in Latvia. I hope I will find some Lithuanian coins soon. I had thought of going to Lithuania to buy some starter kits, but then I decided it's too expensive because of gas price. krisandba wrote: I hope I will find some Lithuanian coins soon. I had thought of going to Lithuania to buy some starter kits, but then I decided it's too expensive because of gas price. I have encountered apparently Pole in Kaunas Bank of Lithuania, buying starter kits. Five starter kits per person limit was in Latvia too, but that didn't stop me from buying 20 of them. I would have bought more, but I already was exchanged all my lats (old currency) to euros. By the way, do you know how long it will be possible to exchange litas? I still have about 100LTL, unfortunately in very used banknotes, so I don't want to add them to my collection. krisandba wrote: Five starter kits per person limit was in Latvia too, but that didn't stop me from buying 20 of them. I would have bought more, but I already was exchanged all my lats (old currency) to euros. Till the end of the days. You will be able to do exchange in commercial banks and post offices till 2015.07.01, and then for unlimited amount of time in two offices of Central bank of Lithuania in Vilnius and Kaunas. You will be able to do exchange in all commercial banks till 2015.07.01 (some until 2016.01.01) and post offices till 2015.03.01, and then for unlimited amount of time in offices of Central bank of Lithuania in Vilnius and Kaunas. Or you can change them in Latvijas Banka till 2015.02.28. My advice - you can easily wait until spring, then come to visit us, or find some things to do in Riga. Remark - Riga only! Liepajas filiale will not make the exchange. Well, in Bank of Lithuania the limit was five starter kits for buying at once. In Swedbank and SEB, perhaps, they even checked passports and IDs and wrote them down to the database, that the person couldn't buy more in any branch of bank in Lithuania. Silly, but wasn't that implemented, e. g., in Latvia? xpetrovic wrote: Well, in Bank of Lithuania the limit was five starter kits for buying at once. I don't remember about Swedbank, but in SEB they asked you from ID and checked in their database. But in Citadele (local bank, I think it's only in Latvia), they didn't ask anything, so you could buy so many as you want. So, anybody found any Lithuanian eurocoins so far? Got my first one today. krisandba wrote: Got my first one today. 10 and 20 Litas too? Where? In Lithuania?